This is not meant to be a review of The Lion, the Witch, and the Wardrobe so much as a collection of personal reflections. (If you're looking for reviews, check out this link .) I saw the movie on Friday afternoon with my son. In general, we both liked it very much. If we were playing Ebert and Roper, we'd give it two thumbs up. The film did an excellent job overall portraying the essential story, thus helping Narnia come to life through the magic of computer graphics and the otherworldly countryside of New Zealand. As I watched the film, I was reminded that the story was, indeed, originally meant for children. Thus the movie, because it was faithful to the book, is also best for children (not very young ones, however, because of the violent battle scenes). Though enjoying the film, I found myself at points missing the layered intricacies of The Lord of the Rings saga. Yet the child in me loved watching talking beavers and didn't miss the sometimes confusing subtleties of the Rings tale. The movie version of The Lion, the Witch, and the Wardrobe, is, like the book on which it was based, much simpler in storyline than Tolkien's weighty masterpiece. Though faithfully depicting the essence of Lewis's original story, the movie adds and subtracts elements, as indeed any film adaptation of a book must do. It isn't a slavish reproduction, but an inspired retelling of the Narnia story. I can understand why the filmmakers added some action that wasn't in the book (like the chase by the sleigh and the river crossing) because the first half of the movie, like the book, meanders slowly along. I found myself disappointed and surprised by one bit of the book that didn't make it into the movie. For me, it's one of the most moving and enticing parts of the novel. I'm referring to the dialogue between the children and the beavers, in which they discover who Aslan is, that he's not a man, but a lion. Susan asks, "Is he – quite safe?" Mr. Beaver responds, "'Course he isn't safe. But he's good. He's the King, I tell you." A new revised standard version of this line made it into the film, but only at the end. I wish the original dialogue had been left intact and in place. The film's depiction of Aslan will, no doubt, engender lots of conversation. For those of us who love The Chronicles of Narnia in general , and Aslan in particular, I can't imagine any portrayal of Aslan that would fully meet our expectations. Nevertheless, I was surprised by the ordinariness of Aslan. He didn't seem to be much bigger than a real lion. His voice, which at first I kept hearing as that of Qui-Gon Jinn or Oskar Schindler, is far less basso and daunting than I would have imagined. Maybe I missed James Earl Jones's Mufasa. If anything, I found that the film portrayed the White Witch as more awesome than the book's character, and Aslan as less awesome. My personal jury is still out concerning whether or not I prefer this portrayal of Aslan. I did miss the majestic King of the Chronicles, yet, at the same time, I think the film's depiction gives Aslan a different sort of power, not so much physical strength as moral character and, in the end, love. Here's where I make a lion-sized leap to a reflection upon Aslan as a Christ figure. I expect most of my readers will now that C. S. Lewis intended Aslan to be a Christ-like figure in the fictional world of Narnia, some I'm not reading into the text here. Christians believe that Jesus Christ was fully God and fully human, the veritable Word of God in the flesh. It's very hard, however, for us to keep the two natures of Jesus together. We tend either to make Him a powerful God who is barely human, or a genuine human who is hardly God. 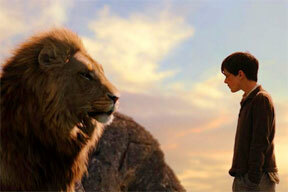 The Aslan of the Narnia movie represents a Christ who is very human, though still the King. For those of us who tend to make Aslan and Jesus bigger than life, this may be a good corrective. And it may be especially appropriate as we draw near to Christmas. At Christmas we celebrate the birth of Jesus, the Son of God in human form, the Creator becoming part of the creation. Jesus was really born as a vulnerable human being. He really cried, really felt hunger, really felt pain, and, ultimately, really died. He wasn't God pretending to be human, but God who became fully human. Thus, when I see Aslan pictured more as a real lion than a super-lion, I'm reminded of who Jesus really was as God's Son, not in the magic land of Narnia, but in our world. No depiction of Jesus, in film or books, in art or song, in poetry or theology, will ever fully capture the truth of who He really is. Every human effort will fall short of that truth. Every portrayal will miss the perfect balance of the Incarnation. Yet when the portrayal gets many things right, as does Lewis's Aslan, both in book and in film, then it has the power to challenge us to know the real Jesus better. I went to The Lion, the Witch, and the Wardrobe expecting to be moved by the parts of the story that have brought me to a deeper experience of the cross and resurrection of Christ. And, indeed, I was so moved. But, unexpectedly, I came away from the film reflecting on the humanity on Christ, and on the wonder of His birth. Thus, for me, The Lion, the Witch, and the Wardrobe has enriched my preparation for Christmas. 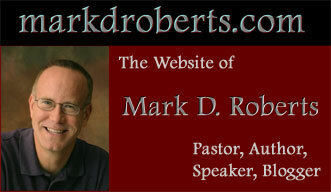 As many of you know, I sometimes blog on two others sites, Theologica and OneTrueGodBlog. Once in a while, if themes overlap, I'll double-post, putting the same material up on two websites. As it turns out, today is one of those days. OneTrueGodBlog is moderated by Hugh Hewitt. He has gathered a panel of five popular theologians from a variety of Christian traditions. Hugh's job is to ask challenging questions. Our job is to answer them. Today, Hugh posted a question related to the new Narnia movie. My answer to his question fits nicely in my current discussion on markdroberts.com of this movie. Hence the double post. Though I'm the first to answer Hugh's question at OneTrueGodBlog, I'd encourage you to check back when the others weigh in. It's always a fascinating dialogue. Imagine that you encounter an individual leaving The Chronicles of Narnia: The Lion, The Witch and the Wardrobe. This individual is not only not a Christian, he or she has never been exposed to scripture and has no concept of basic Judeo Christian theology. The movie-goer looks at you and says, “What was that all about?” How do you respond? First, let me talk about communication strategy before I get into content. If a person unfamiliar with Christianity, or familiar but uninterested, were to ask me about the Narnia film, I would not rush to talk theology. I've found that this approach generally pushes people away. They think to themselves, "Religious fanatic! Watch out!" and that's the end of a two-way dialogue. If I want a real conversation with someone, and not simply an impromptu sermon with an unwilling congregation, I've found that asking questions is almost always more effective than giving speeches. So, if someone were to ask "What was that all about?" I'd be inclined to say something like, "Now that was one heck of a movie. What did you think about it?" Where I'd go from here in the conversation would depend on what my partner said. I want to add a word of caution here. I've observed conversations like this where the Christian seems to be interested in what the other person says, when in fact the believer is simply looking for an opportunity to talk about Christ. I don't think it's wrong to seek such an opportunity, but it must come in the context of genuine interest in the opinions of the other person. Most people can figure out when they're being set up for some agenda-driven conversation, and they don't like it. As the conversation progressed, I'd be most interested in what this person thought about Aslan. Was Aslan an appealing character? What did he or she think about Aslan's sacrifice? At some point I'd probably ask something like: "Did you know that C.S. Lewis intentionally created Aslan as a kind of Christ figure?" This might become a segue to conversation about Lewis, or even about Christ himself. But I wouldn’t force the conversation in an evangelistic direction unless it was flowing that way naturally (or by the Spirit). When it came time for me to share my own thoughts about Aslan and his representation of Christ, I'd avoid preachiness at all costs. (I'll admit this isn't always easy for me because I am, after all, a preacher.) Nevertheless, I'd tend to share my personal responses to Aslan rather than treating the conversation as a Theology 101 class. For example, I might admit that I felt uncertain about whether I liked the "ordinariness" of Aslan or not. (See my last post for an explanation of what I mean .) If my conversation partner was attentive, this might well lead into a conversation about the nature of Christ as fully God and fully human. It would allow me to share some deep theology while, at the same time, admitting that this mystery exceeds my grasp at many points. 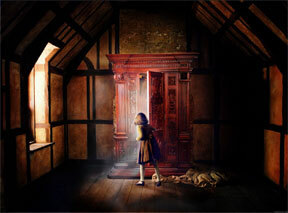 The Narnia film allows people to peer into the kingdom of God without even knowing it. In my experience, what many people today find offensive about Christians is our tendency to pretend as if we have all the answers, and to insinuate that we're better than others for this reason. We do believe we have some wonderfully true answers to life's questions. Yet we surely we don't have all of them, and what we know we know "as through a glass darkly." Moreover, whatever we know about God depends, not on our personal excellence, but upon God's mercy. Now that I've said a few things about how we might converse about the Narnia film with someone who has no Judeo-Christian background, my next post will deal with the content of that conversation. Last time I talked about how one ought to approach such a conversation. In a nutshell, I made an appeal for genuine dialogue rather than preachiness. In this post I'll begin to talk about how a conversation about the Narnia movie might lead into a broader dialogue about religion and philosophy, and ultimately about the good news of Jesus Christ. Though we might want to go immediately for the Christological Jugular Vein, and talk about the ways in which Aslan is like Christ, in actuality The Lion, the Witch, and the Wardrobe presents the opportunity to discuss a wide range of philosophical and theological issues. For example, I might start by asking my conversation partner something like this: In the Narnia movie, there's a dualistic worldview, with good on one side and evil on the other. One must choose one side or the other, without much if any space in between. What do you think about this? Is our world like Narnia? Do you think there's good and evil, or is everything a combination of both? In the exchange following these questions, I'd share my conviction that our world is indeed very much like that of Narnia, though I think the battle lines are often not so clearly drawn. I'd talk about how Christian dualism is not ontological (a matter of being), with good and evil evenly matched. In the end, our world, like Narnia, is the creation of a good creator. Aslan and the White Witch are not equals. Likewise with God and Satan. Yet because God is often hidden, and because Satan is a deceiver, we sometimes face a difficult challenge in trying to decide how to be on the side of good and not evil. Another question that emerges from The Lion, the Witch, and the Wardrobe has to do with prophecy. I might ask: Do you think there are prophecies in our world like the one in Narnia that predicted the defeat of evil and the enthronement of the four children? Where do these prophecies come from? Do they mean that all human behavior is ultimately predetermined? The whole notion of prophecy gets into the conversation about the nature of reality and the nature of freedom. If this seems too narrowly Judeo-Christian, remember that many popular tales involve prophecies: The Matrix movies, Harry Potter, Lord of the Rings, etc. Closely linked to this question would be: Do you think all people have predetermined destinies? Even as Peter, Susan, Edmund, and Lucy had a task to accomplish that was assigned to them without their choice, is this true for us as well? If so, how do you know what you destiny is? This line of questioning leads to a consideration of one's purpose in life. It would allow me to talk about my own sense of calling, which is an obvious implication of my Christian faith. Finding God in the Land of Narnia, by Kurt Bruner and Jim Ware, is a very readable and surprisingly profound treatment of the Christian implications of the Narnia story. Another line of questions suggested by the Narnia tale has to do with fundamental ethical/spiritual truths: Is there something like "deep magic" in our world? Are there certain basic truths that govern our lives, from which we cannot escape? Or do we get to make up reality as we go? These questions lead quickly into the questions of what makes right right, and wrong wrong. They also allow us to talk about sin as something that violates the "deep magic" of God's nature, if you will. Ultimately, this helps to account for why God cannot simply forgive sin without any sacrifice on the part of a savior. One of the toughest challenges Christians face today when talking about our faith is that so many people do not share our basic worldview. They do not believe in a creator, or in a personal creator, at any rate. Or they do not believe in a strict dichotomy between good and evil. Or they do not believe that there is such a thing as sin. Many people are not prepared to receive the Christian gospel as good news because they simply don't accept the presuppositions (good creation; reality of sin; holiness of God; etc.). One of the greatest things about The Chronicles of Narnia is that its worldview is so essentially Christian, even though the actual world of Narnia is so fanciful. In Narnia there's a Creator; there's good and evil; there's profound meaning to life; good and evil are in conflict; the Creator is ultimately in charge; etc. etc. Thus exposure to the Narnia film allows one who is not a Christian to catch a glimpse of what may seem like a very foreign worldview. But this worldview must be grasped if one is going to talk meaningfully about Aslan, which I will try to do in my next post. Note: Han Cornelder, webmaster of the always helpful Presbyweb (subscription, and well worth it), has suggested that my questions in the last post might be helpful, not only for one-on-one conversations, but also for group discussion in adult classes, small groups, etc. This is a good point, and one I had overlooked. Thanks, Hans! I began by laying out my basic communication strategy for talking with such a person. 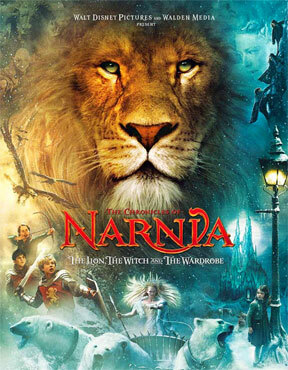 My next post focused on the broader worldview issues raised by exposure to the fictional world of Narnia. In this post I want to focus on Aslan. Once again, if I were talking with someone who wasn't familiar with Christianity, I would not immediately begin by lecturing that person on how Aslan is like Jesus. Rather, I'd ask lots of questions. I'd do this, in part, to look for a convenient opening for talking about Jesus. But also I'd do this out of genuine curiosity about what someone else thinks and why. I'm always fascinated to listen to how people from non-Christian backgrounds understand things Christian, and Aslan certain fits into the "things Christian" category. I'd probably start with something easy and obvious like: So what did you think of Aslan? No doubt any answer to this question, other than "Dunno," could lead in fruitful directions. One direction might focus on Aslan's understanding of "Deep Magic" and his ultimate sacrifice in light of that understanding. Questions might include: Why did Aslan seem bound by the "Deep Magic"?Is there anything comparable to this in our world? Then there's the whole issue of the price to be paid for Edmund's treachery. The rationale given in The Lion, the Witch, and the Wardrobe for a life to be sacrificed is fascinating. According to the White Witch, the Emperor-Beyond-the-Sea put Deep Magic into Narnia before the dawn of time. This Magic determined that any traitor belongs to the Witch, and she has the right to kill him or her. Aslan agrees with the Witch's summary of the Deep Magic. Within the world of Narnia, we might wonder, does this make sense? Why does one act of treachery lead necessarily to death? Is this a fair price to be demanded of a traitor? I expect that many people today would consider the penalty to be far too strong, especially if Edmund "felt sorry" or if his behavior could be explained as a result of Peter's meanness. If we think of The Lion, the Witch, and the Wardrobe as a kind of allegory, though not a strict one, the Deep Magic issue helps to raise the question of why Christ had to die for us? Was His death somehow a payment to the Devil? This is one classic understanding of the rationale for the crucifixion, though it may not be the best one, or even a correct one. 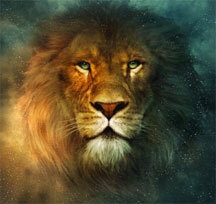 Nevertheless, the case of Aslan can lead into a discussion of Christ's death, both its cause and purpose. On a much more personal note, I'd be interested to see if a non-Christian moviegoer felt emotionally drawn to Aslan. It's so easy for Christians, who feel the Aslan-Christ connection, to fall in love with Aslan. Our hearts and minds fill in many blanks left open in the book and movie. In truth, The Lion, the Witch, and the Wardrobe doesn't give us much to go on when it comes to Aslan. He appears fairly late in the story, and we don't get more than a few small windows into his character. So I'd want to ask: Did you feel drawn to Aslan? Did you feel an attraction to him as a character? In turn I'd be able to share my own feelings for Aslan, which are quite strong because they're influenced so much by my love for Jesus. Finally, I'd be curious to learn what a non-Christian moviegoer thought of Aslan's strength and majesty. In my personal reflections on the movie, I shared that I was surprised at how relatively ordinary Aslan was. I didn't mean this as a criticism, necessarily, though I'm not sure to movie version of the character accurately represented what we find in the book. Be that as it may, I might ask my conversation partner: Do you have any idea what it is about Aslan that Christians find to be so much like Jesus? Then I'd share my own observations, including the mystery of Jesus's nature as fully divine and fully human. I'm not quite done answering Hugh's question. There is something else I'd want to talk with my non-Christian friend about, something that gets to the very heart of my personal response to the Narnia movie. It's something which, I believe, takes down barriers between people and allows folks to peer into the heart of grace. I'll blog about this tomorrow. I began by laying out my basic communication strategy for talking with such a person. My next post focused on the broader worldview issues raised by exposure to the fictional world of Narnia. Then I wrote about how I might talk about Aslan and Christ. Today I want to conclude this series by discussing how I become personally engaged in the Narnia story, and how my conversation partner might also become so engaged. So, if I were having a conversation about The Lion, the Witch, and the Wardrobe, among my key questions would be: Did you relate personally to any of the characters in the film? If so, why? What about that character grabbed onto your heart? As I've said before, I go with the flow here, with my chief purpose at first being to get a better understanding of my conversation partner. At some point I'd ask: So, which character do you think I relate to personally? Of course I'd be bummed if my partner said, "The White Witch." My guess is that a person who didn't know me well might think that, because I'm a pastor, I'd relate to Peter, or that because I'm a professor, I'd relate to the Professor. These would be good guesses, but they'd be wrong. The character I relate to most profoundly is Edmund. Now you may be inclined to think poorly of me, since I have confessed to feeling an emotional connection with Ebenezer Scrooge and Edmund Pevensie, not exactly the sort of people you want to hang around with, at least in their "before" rather than "after" existence. But I'm telling the truth about my link with Edmund. Please allow me to explain. First, Turkish Delight. I have a weakness for Turkish Delight. No, I'm not talking about the real candy, which I have tried and don't need to try every again. I'm talking about what Turkish Delight represents in The Lion, the Witch, and the Wardrobe. It's the temptation that delights and then betrays. It's that which seems to fill us only to leave us empty. It's that which draws us away from what is good to embrace evil. In a nutshell, Turkish Delight is sin. But it isn't sin in the raw sense. It's sin as temptation, as deception, as emptiness. 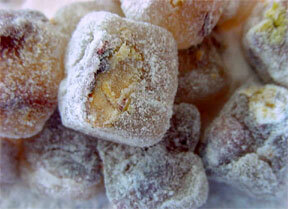 Pecan Turkish Delight. Any takers? I am not going to share with you all of my personal "Turkish Delight" sins, but there are plenty. One is the need to control that which belongs in God's hands alone. I seem to think sometimes that I can do a better job than Almighty running things. I'm lured into a kind of autocracy, and it feels powerful. But, inevitably, my wisdom fails and my personal resources run out. I realize that what I found so enticing was taking me further and further away from what my heart most desires and what I most need: life under God's sovereignty. So when Edmund wants more and more Turkish Delight, and when he even comes to betray his siblings partly because of this obsession, I can relate. And I can also relate to the shocking devastation when he comes to realize what his passion for Turkish Delight has done to him and those he loves. I know I'm not alone in my weakness for Turkish Delight. As a pastor, I meet with many who share this frailty. People throw away their families for the Turkish Delight of financial success, or for the momentary pleasures of adultery. They sacrifice their souls for accomplishments that never satisfy. This happens all the time, even to "good Christian folk." Yet I also relate to Edmund as one who has been graciously delivered from the fate I deserved. You see, I do believe that, though I have not been a traitor in many obvious ways, I have indeed betrayed my Creator through my sin. And I do believe that such a betrayal deserves death. Thus, apart from a Savior, I am on death row, right where I should be. Like Edmund, however, I have a Savior. He has Aslan; I have Jesus. Like Edmund, I have been set free from the Deep Magic (the wages of sin is death) by the substitutionary sacrifice of my Savior. As it says in the New Testament, "For God made Christ, who never sinned, to be the offering for our sin, so that we could be made right with God through Christ" (2 Corinthians 5:21, NLT). Of course The Lion, the Witch, and the Wardrobe doesn't end with Edmund's salvation, if you will. It also shows a glimpse of the new Edmund, the redeemed Edmund, the Edmund who is forever changed by his relationship with Aslan. I also relate to this Edmund, the "after" Edmund who follows the "before" Edmund. Though I continue to struggle with a deep-seated desire for Turkish Delight, nevertheless Christ uses me for His purposes and helps me to become more and more free from the power of sin. I'm not done yet, to be sure. But, with profound gratitude, I can see ways that I'm different because of my relationship with Jesus Christ. One of my favorite scenes from the book and movie, though we don't know what Aslan said to Edmund, we know this encounter changed Edmund forever. Talking about Edmund would help me, not only to explain some core Christian theology in fairly available terms, but also to share my own experience of being saved by the grace of Christ. This may sound preachy, but it's not. I couldn't truly talk about my own response to The Lion, the Witch, and the Wardrobe without sharing my connection to Edmund, which requires that I describe my encounter with the Aslan of this world. Note: John Mark Reynolds, a Biola University professor of philosophy who writes for OneTrueGodBlog, has put up a marvelous response to Hugh, called "To My Religious Friend."